Whilst it is nice to have access to the big paid-for SEO tools we don’t always have the budget. In a previous post I have covered SEO tools using Google Docs and in this post I wanted to share some of my favourite free SEO tools and resources that are specifically for Excel lovers. SEOgadget Link Categoriser Tool– a classic that I have been using for some time. Drop in your report from Open Site Explorer and get a lovely break down of anchor text distribution and an overview of the kind of links that you have. Great for working on Penguin-hit sites but also useful for profiling a niche to see what is working at this moment in time. SEOgadget Links API Extension – get the magic of Open Site Explorer and Majestic SEO’s wealth of data straight into Excel. Nice. Bucketing Link Prospects for Outreach – this nifty little spreadsheet is from John Doherty. What is great about this spreadsheet is the dashboard that lets you see how your response rate works over time and across the different buckets – useful for keeping the spirit up when conducting outreach. Link Profiling with Open Site Explorer – Dr Pete put together this spreadsheet some time ago for profiling your links – its quick and easy (or it was the last time I used – let me know if it has stopped working) and could definitely be helpful for those working on link profiles but on a limited budget. 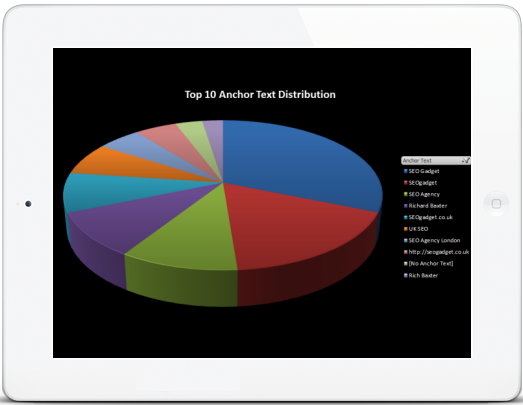 Anchor Text Distribution Spreadsheet – a simple way to quickly visualise your anchor text in Excel by Ian Bowden. SEO Dashboard In Excel – SEO tools are great – but they also come at a price. If you are working on a budget you still need to be able to gather the data that will inform your SEO decisions. This SEO dashboard from Zach Olsen is perfect for that. Advanced Keyword Performance Dashboard – a nifty use of pivot tables from Himanshu and a step by step guide for creating the excel spread sheet that will allow you to analyse the data. 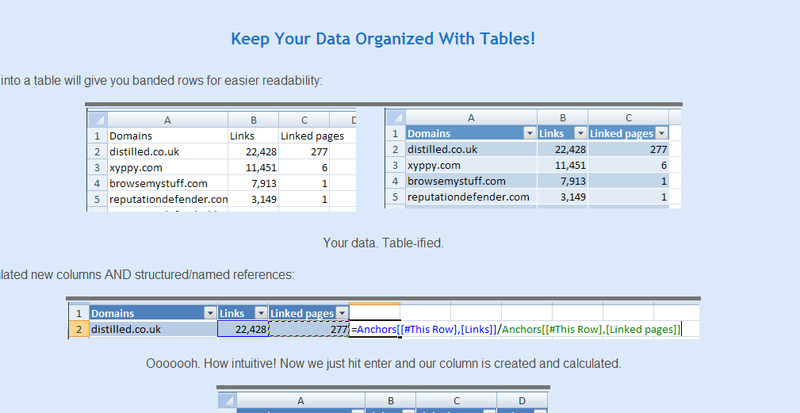 SeoTools for Excel – the best known (and the best) SEO plugin for Excel created by Niels Bosma. If you haven’t downloaded and used this tool yet, you are missing out on an absolute gem. Its power comes from its flexibility – it allows you to carry out on page analysis, backlink research (now with added MajesticSEO), scrape social media or carry out domain research. Essential. SEOgadget Google Adwords API Extension – updated back in November of 2012 this plugin makes life easier for those trying to deal with lots of keyword data – pulling it straight from the API into Excel. Excellent Analytics – a nice little plug in that will allow you to pull your Google Analytics data straight into Excel. Microsoft Excel for SEO’s – the original and probably still the best guide that is specific to SEO requirements (and it looks pretty too). Created by distilled’s Mike Pantoliano. SEO Excel Functions – an oldie from AJ Kohn but one that has his usual laid-back and easy to understand style. Bookmark it! Tips on Using Excel for SEO and Link Building – I love posts that are written by people who are really in tune with two topics and then manage to align them. This post by Chris Gilchrist isn’t one of them – just kidding Chris its great 😉 There are a few nice tips in this post that you won’t find anywhere else, I heartily suggest that you pop off and read it. Excel for SEO – Powerful Cheat Sheet to Boost Productivity – a monster of a post and one that I have had bookmarked for some time. The only downfall is that it doesn’t look very pretty – Himanshu if you are reading this we need to make this into something pretty so that it can be downloaded and printed off! Cogniview Excel Cheat Sheet – a simple cheat sheet that will sit nicely next to your computer without cluttering up your workspace. Annie’s wonderfully named blog is well worth a visit if you wanted to dig around with Excel tips that are generally specific to SEO. There are a few videos on there that are well worth your time. By and far the best Excel blog that I subscribe to. It’s been around for over six years now and has posts that are geared towards beginners and more advance users alike. It isn’t geared towards SEO but I guarantee that you will learn some amazing stuff that you can apply to your everyday work. Have you got any favourites that I have missed? Let me know in the comments.